If you have stellar customer service skills, work well in a team atmosphere and like to have FUN, come talk to us! We strongly believe in promoting from within and growing together! Starting wages are $15/hr for movers, Plus Tips! $17/hr for qualified drivers and up to $20/hr for well-qualified candidates with experience! WE OFFER HEALTH AND VACATION BENEFITS! Established in 2015, Gorilla Movers of Wisconsin Inc. is a family owned and operated company with over 15 years in the industry. Award-winning and one of the top rated companies in Wisconsin, we are seeking righteous people to join our family! We provide uniforms (Shirts, shorts, pants, shoes and hats and more!). Assigned trucks with teams, tools, and equipment. Not only do we specialize in customer service and furniture relocation, but we also move; hot tubs, gun safes, pianos, large play structures, and motorcycles. Typical start time is 7:00 am Monday-Saturday, so if you have issues getting to work at this time, this job may not be for you. We treat everyone fairly and straightforward, we expect nothing less from everybody! 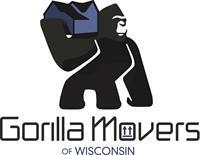 Gorilla Movers of Wisconsin Inc."